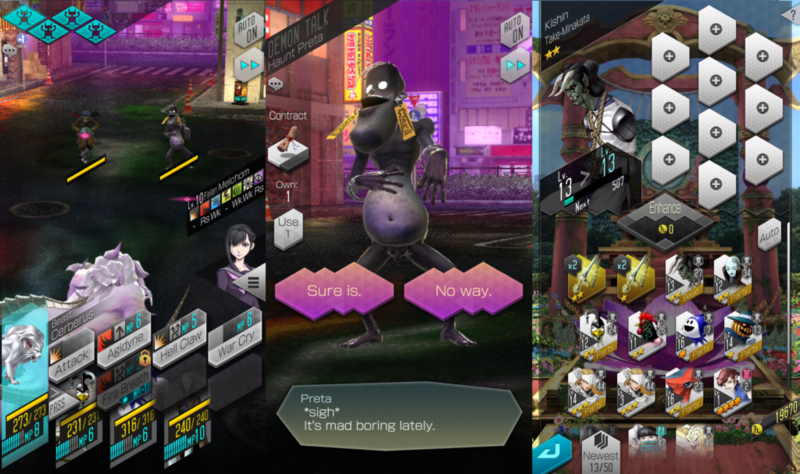 A MegaTen flavored take on the Puzzle & Dragons free-to-play formula was inevitable. Mashing monsters together to make new stronger monsters is the franchise’s bread and butter, after all. I was quite surprised, though, that this mobile version of SMT retains so much of the series’ identity. The combat system is the Press Turn system, verbatim, with all the elemental affinities, debuffs, and status effects intact. There’s still a demon negotiation system, very slightly streamlined to reduce frustration (I don’t think demons will turn you down after you comply with their demands). Somehow they even squeezed first-person dungeon crawling in! The only real simplification compared to a mainline SMT game is a much smaller number of skills per demon. This game has new, fully animated 3D models for all the demons, and they’re not the same as the cel-shaded ones developed for Persona 5. That’s kind of bonkers considering how much use Atlus squeezed out of the PS2 demon assets, and the fact that SMT skipped the PS3 entirely while they invested in their HD art pipeline (using Catherine as a testbed). SMT doesn’t use the standard palette-swap strategy to get more use out of the same enemy assets; every demon is unique, so it’s rare for the asset library to get a complete overhaul. I figure the Persona 5 demon models will be used in SMT5 and any other SMT games for the foreseeable future. Meanwhile the models in Dx2 are quite accurate to the traditional Kazuma Kaneko designs, and presumably optimized for mobile performance, but it’s quite an investment on Sega’s part – particularly since the longevity of this mobile formula depends on having an even bigger list of demons to collect than a typical console SMT. What will inevitably cause me to lose patience with Dx2, as with all similar games, is the UI. This area is where it becomes obvious that Atlus didn’t develop the game. There are an overwhelming number of grinding systems, currencies, and loops, presented in a comically dense interface. It has a nice sense of style – as well as some very appealing original music that harkens back to Persona 3 and Nocturne – but there’s nothing like the sleek, elegant presentation of information in the Persona 5 UI. Managing your inventory of demons is a nightmare, and in games like this inventory management is a primary gameplay mechanic. The story is very light and breezy compared to the usual SMT fare, and it doesn’t get in the way. There are dialogue choices and the interface occasionally implies that your choice effects some hidden variable, but there’s been no indication of an alignment system or anything like the usual order-versus-chaos theme. The leader of your demon-fighting organization is basically a popular Youtuber, and the most unrealistic part of the premise is that he hasn’t said anything racist yet.